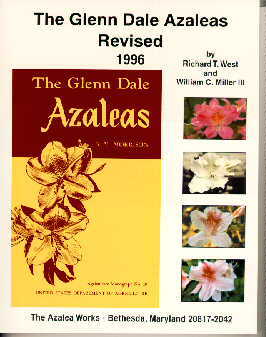 The Azalea Works in Bethesda, Maryland has published two landmark works on the Glenn Dale hybrid azaleas: The Bell Book by Miller and West and The Glenn Dale Azaleas Revised by West and Miller. The basic cost of The Glenn Dale Azaleas Revised is $35.00 plus 6% tax for Maryland residents. All checks or International Money Orders (in US dollars) should be made payable to THE AZALEA WORKS.